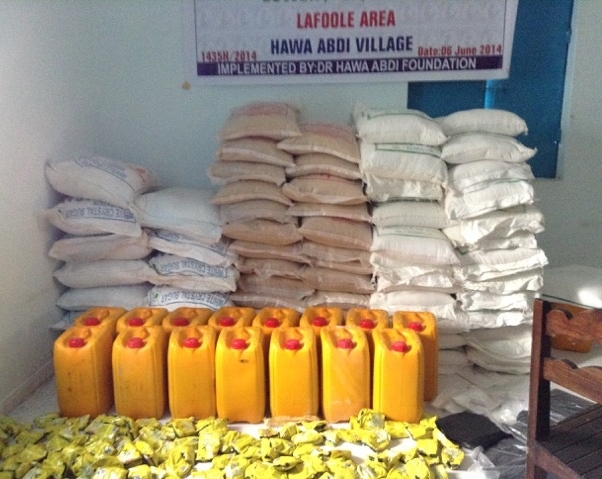 The Dr. Hawa Abdi Foundation has always been there in times of crisis to provide life-saving nourishment and care to those who need it most. In Hope Village, we strive to ensure that our residents are never hungry. And in 2017, when Somalia experienced the most severe drought in Somalia’s living memory, we helped provide life-saving food, clean water, and healthcare to hundreds Somalis at risk of starvation. To respond to the drought, we set up a feeding center in Hope Village to provide daily meals to more than 600 people each day, half of whom were children. At the Dr. Hawa Abdi General Hospital, we scaled up our healthcare operations and treated more than 3,500 children for malnutrition and more than 150 for life-threatening severe watery diarrhea. During the drought crisis, we also teamed up with a group of volunteers from the Somali diaspora to deliver food to the neediest and to map the crisis. Abaraaha (which means ‘famine’ in Somali) created a unique, online, interactive map that let us track the nationwide crisis – disease outbreaks, numbers of deaths, where food had been delivered and where food was needed, and how to coordinate other humanitarian aid efforts. Every Ramadan – the holy month in Somalia – we offer free meals to 500 people every day, the majority of whom are women and children. In 2018, we provided a total of 14,500 people with meals.